Enlighten Tooth Whitening System is the Premium brand in tooth whitening treatments. It is used for more difficult cases or where the patients wants a guaranteed result of B1 brightness. 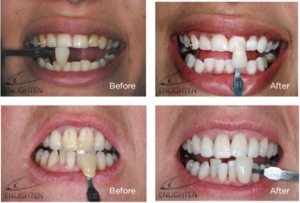 Why use the Enlighten tooth whitening system as compared to other systems? Guaranteed B1 shade and highly reliable results across your smile. Convenient for patients to use as no dietary changes are required. Results in just 2-4 weeks from start of treatment. Only system in the world that will whiten up to 16 shades easily and safely. Whitening products refrigerated all the way from manufacture to surgery ensuring optimal effectiveness of whitening gels. No lights, gingival protection or dehydration whitening. Specially tailor make whitening custom trays according to case, i.e. increased reservoir built in for darker teeth. Visit 1: In your first visit we will take impressions of your teeth, using special impression material supplied by Enlighten. These impressions will be sent to an Enlighten state of the art laboratory, who will then fabricate high quality sealed bleaching trays for you. This will take about 2 weeks to be ready. During this time you will need to use special tooth paste twice a day every day, which contains a material called Hydroxyapatite (HAP) which is what your Enamel is made of, 97% of it in fact! This HAP will not only improve the whitening effect but it will also protect your teeth and reduce any sensitivity. Visit 2: On the next visit you will pick up your bleaching try from dentist together with whitening gel which you will need to use for 14 CONSECUTIVE NIGHTS. Visit 3: Lastly you will return to your dentist for a 40 minute treatment in the surgery. Make sure you bring your whitening trays with you. This final treatment will not only boost the colour but will ensure the whitening is even and natural looking and help the colour to be more stable i.e. the whitening will last longer. If the teeth are still sensitive, it may be advisable to use anti-sensitive toothpaste, such as Colgate Pro relief or Sensodyne. Teeth whitening is a safe, effective, non-invasive and popular method of brightening all natural teeth. Some patients experience sensitivity during the whitening process, however this is minimised with the use of anti-sensitive toothpaste. It is vital that the procedure is followed strictly as this will ensure the best overall results are achieved. Will Enlighten teeth whiting whiten my crown and veneers and previous fillings? Enlighten teeth whitening only whiten your natural teeth. It does not whiten porcelain or white composite restorations and these may need to be changed if you wish to have the colour matched to your new whitened teeth. How long will Enlighten last for? The great news is that with Enlighten whitening you can keep your teeth whiter forever, you may need a whitening top up for a couple of days, in a year or two, so it is advisable to keep your trays safe and you can purchase more home gel at a fraction of the price when you feel the need to. Enlighten guarentees the B1 shade of the teeth post using their product, providing their instructions have been followed. If the B1 shade has not been achieved they will refund the laboratory costs and product costs. Please note: the dental costs are still payable, so patients will receive a refund of total treatment cost minus enlighten product and laboratory costs. If you would like to discuss Enlighten Whitening or any other dental procedure please do not hesitate to ask one of our friendly clinics.